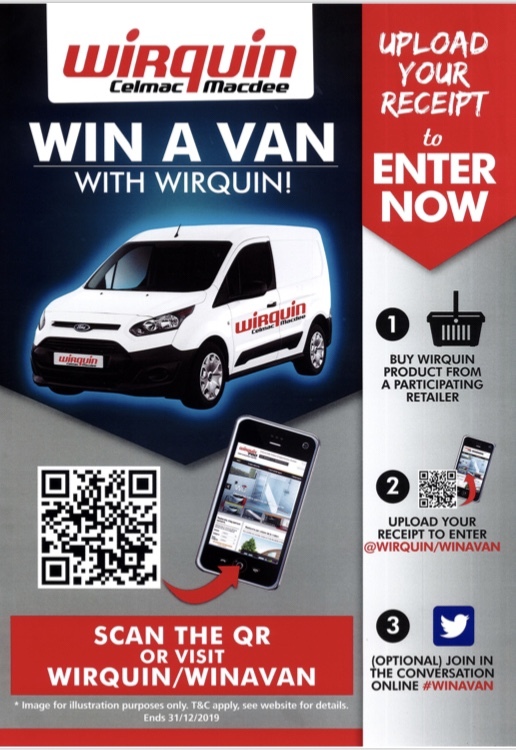 Sanitary equipment manufacturer Wirquin, is to give away a Ford Transit Connect van to one of its customers in a 2019 special promotion. Wirquins Marcomms Manager, Alaina Turner said “The competition is set to run from the 1st March to the end of December 2019 and the winner will be presented with their prize in January 2020. What’s more, entrants will have a bonus chance to win £250 worth of Wirquin products within the month they entered the main competition as an extra incentive. There is no minimum order value, and the more an installer purchases, the more receipts they can upload and therefore a higher the chance that they’ll win! QR codes linking to the entry form online can be found within participating retailers on promotional merchandise”. Interested retailers who wish to join in the promotion can contact sales@wirquin.co.uk. To keep updated on the progress of this huge #WINAVAN competition follow Wirquin on twitter @WirquinLtd. These Terms and Conditions (T&Cs) prevail in the event of any conflict or inconsistency with any other communications, including advertising or promotional materials. By participating, entrants agree to be bound by these T&Cs. 1. The Promotion will run in participating Wirquin stockists/retailers from 1st March 2019 until 31st December 2019. The Promotion is only open to residents of the United Kingdom (including England, Scotland, Wales and Northern Ireland), Channel Islands and the Isle of Man aged 18 or over, excluding all employees and the immediate families (someone's spouse, parents and grandparents, children and grandchildren, brothers and sisters, mother in law and father in law, brothers in law and sisters in law, daughters in law and sons in law; including adopted, half, and step members) of employees of the Promoter and anyone else professionally connected with the Promotion. 2. b) Participants must upload their receipt to the Wirquin website by visiting www.wirquin.co.uk/winavan and completing and submitting the online entry form, including all required contact fields, clear image of the receipt and name and location of the stockist where the item was purchased. 3. c) Entrants can upload multiple receipts to the competition but not duplicates of the same receipt. Any duplicate entries of the same receipt will automatically void all entries for that participant. 4. Entrants from Northern Ireland may, but do not need to, purchase a product or upload a receipt to enter, they may simply complete all other online contact detail fields. Northern Ireland entries are limited to one per person, per month for non-product purchase entries, however entries into the main prize draw for non-product purchase entries shall be limited to one per person. 1. a) Entrants will automatically be entered into a random prize draw which will be drawn at midday on Monday 6th January 2020. 2. b) One individual will win a Ford Transit Connect, the model of the van will be at the decision of the promoter to the minimum value of £15,000. An equivalent cash prize option of £15,000 may be considered by the Promoter. 3. Vehicle extras such as Insurance will not be covered by the Promoter, only the van itself. c) The date the Promoter receives the entry will dictate which monthly prize draw the entrant will be entered into. The date entries are received online will be recorded for this purpose. Entries will not be rolled over to the following monthly prize draw but will still be entered into the main prize draw (see clause 4). 8. All claims are subject to verification. Proof of purchase will be required for every prize (excluding Northern Ireland entrants who use the non-product purchase entry method). Receipt images need to clearly show all details including product purchased and branch location. 10. Should a winner not claim their prize within 28 days of receiving notice from the Promoter, the Promoter reserves the right to re- award the prize to a reserve winner. 11. The Promoter shall arrange for each winner’s prize to be delivered within 28 days of notification, delivery is only available to the UK and the cost will be covered by the promoter. 12. The prizes must be taken as stated and no compensation will be payable if the winner is unable to use prizes as stated. 13. Winners may be required to participate in reasonable publicity with the ‘Promoter’ and have their name published as a winner. 16. The ‘Promoter’ reserves the right to withdraw, amend or temporarily suspend this promotion in its absolute discretion, provided that it shall not exercise the right unreasonably and only in exceptional circumstances, outside its reasonable control and only where circumstances make this unavoidable, but will use all efforts to minimize the effect to the participant to avoid undue disappointment. 17. This Promotion and these terms are governed by English law and subject to the exclusive jurisdiction of the courts of England and Wales. 18. By participating in this Promotion, entrants agree to be bound by these terms and conditions. You also agree to allow the Promoter to retain your personal information beyond the promotional period and agree to be contacted by the Promoter by email. You are able to unsubscribe from this communication by ticking the appropriate box on any future emails at which point your personal information will no longer be retained. Any personal data relating to participants will be solely used in accordance with current data protection legislation and will not be disclosed to any third party without the individual’s prior consent.